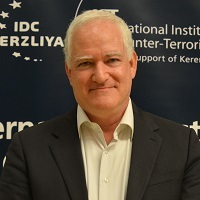 Prof. Boaz Ganor is the Dean and the Ronald Lauder Chair for Counter-Terrorism at the Lauder School of Government, Diplomacy & Strategy, as well as the Founder and Executive Director of the International Institute for Counter-Terrorism (ICT), at the Interdisciplinary Center (IDC), Herzliya, Israel. Prof. Ganor serves as the Founding President of the International Academic Counter-Terrorism Community (ICTAC), an international association of academic institutions, experts, and researchers in fields related to the study of terrorism and counter-terrorism. Prof. Ganor previously held positions at Stanford University, U.C. Berkeley, the Hoover Institution (Koret Distinguished Visiting Fellow), the Monterey Institute of International Studies, MIPT (The National Memorial for the Prevention of Terrorism), Hebrew University and Bar Ilan University. He was also a member of the International Advisory Team of the Manhattan Institute (CTCT) to the New York Police Department (NYPD). Prof. Ganor has given briefings and/or testimonies to the United Nations Counter-Terrorism Executive Directorate (CTED), the Australian Parliament, the United States Congress, the US Army, the FBI, the US Department of Homeland Security, as well as numerous intelligence, security and police services throughout the world. He has given hundreds of guest lectures at top universities and research centers throughout the world including at Columbia University, Syracuse University, Georgetown University, the Wilson Center, RAND and the Washington Institute for Near East Policy. In 2001, Prof. Ganor was appointed as a Member of the Advisory Committee of the Israel National Security Council on Counter-Terrorism, and he has previously served as a Member of the Israeli Delegation to the Trilateral (American-Palestinian-Israeli) Committee for Monitoring Incitement to Violence and Terror. Prof. Ganor also advised the Israeli Delegation for Peace Negotiations with Jordan on Transportation Safety, the Israeli Counter-Terrorism Coordinator at the Prime Minister’s Office and the Israeli Ministry of Defense. In 1995, he was a consultant to Prime Minister Benjamin Netanyahu on his book “Fighting Terrorism – How democracies can defeat domestic and international terrorism”. Prof. Ganor has published numerous articles on terrorism and counter-terrorism. His book, "The Counter-Terrorism Puzzle – A Guide for Decision Makers" (Transaction Publishers, 2005), is used as a text book in universities worldwide and his upcoming book: “Global Alert: Modern terrorism rationality and the challenge to the democratic world” will be published by Columbia University Press. He has published several articles in “Studies in Conflict and Terrorism”, “Terrorism and Political Violence”, “Dynamics of Asymmetric Conflicts”, Orbis and the International Law Studies. He is also the editor of "Countering Suicide Terrorism" (2001) and "Post-Modern Terrorism" (2006). He is the co-editor of “ISC 2005 – Security, Terrorism and Privacy in Information Society” (2005), "Trends in International Terrorism and Counter-Terrorism" (2007), "Hypermedia Seduction for Terrorist Recruiting" (2007), "Terrorism Informatics – Knowledge Management and Data Mining for Homeland Security" (2008), and “The Global Impact of Terrorism” (2008). Prof. Ganor is a Member of the editorial board of Springer Intelligence & Security Informatics (ISI) journal. Prof. Ganor has contributed book chapters for many publications, including to Oxford University Press, Routledge, Springer, and the U.S. Institute for Peace. Prof. Ganor chairs ICT’s International Conferences: World Summit on Counter-Terrorism, and co-directed several research projects for NATO and the Ministry of Public Security. Prof. Ganor is a frequent media and television commentator and has appeared on the BBC, CNN, CBS, ABC, the New York Times, the Guardian, The Wall Street Journal, the Jerusalem Post, Haaretz and many other Israeli and international publications. Sabrina Zeloof of IDC International Radio interviews Prof. Boaz Ganor about the 17th World Summit on Counter Terrorism that will take place on September 11 till the 14th. The outcome of the US elections surprised many people in the United States and elsewhere in the world. Despite the fact that, during his campaign, President-Elect Donald Trump stressed his intention to resolutely fight terrorism in general, and the Islamic State in particular, neither he nor his advisors have presented a clearly formulated strategy highlighting how he intends to achieve these objectives. The only clue to be gleaned from his statements is that Trump’s counter-terrorism doctrine will be different than that of President Obama. What, then, should Trump’s new counter-terrorism policy be and how should it differ from that of President Obama? The session was part of the ICT's 16th World Summit on Counter-Terrorism: "Unpuzzling Terrorism". Prof. Ganor discussed the counter-terrorism situation 15 years after 9/11 attacks. On one hand, the world has more ungoverned spaces than ever. These spaces have been filled with terrorist organizations that possess advanced technologies that they have never been able to utilize in the past. On the other hand, we have now better cooperation in all aspects, including intelligence technology sharing. What conclusions can be drawn from the little information coming out of the terrorist attack at an LGBT club in Orlando; an attack in which the terrorist, Omar Saddiqui Mateen, burst into the Pulse nightclub and murdered 50 civilians, held hostages and injured dozens more over a period of approximately three hours before security forces stormed the club and killed him? Already at this early stage of the investigation one can find oversights and mistakes in judgement made by various authorities that enabled the execution of the worst terrorist attack to take place in the United States since September 11, 2001: intelligence oversights, operational oversights, a limited understanding of the threat facing the US and the entire western world, all heavily and dangerously cloaked in political correctness.